This section is for fans of David Tennant and gives you the chance to get involved with the site and with each other. Read messages that David has sent for his fans who took part in our various projects. 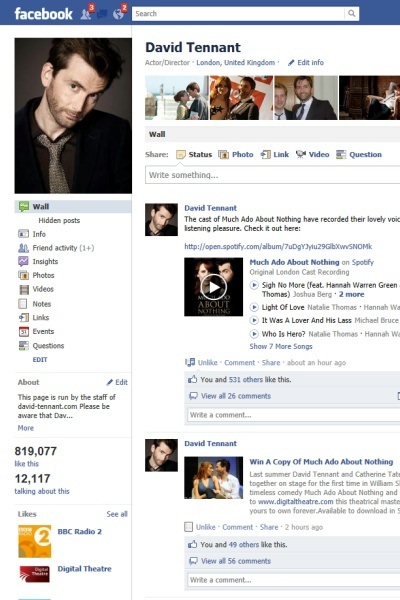 Become a fan of David Tennant on Facebook, we have over 1 Million Likes! Follow David-Tennant.com on Twitter and get snippits of news as it happens. Follow us on Tumblr and see some great fan creations. Links to other sites that we think you'll enjoy. Please note that this site no longer has a forum connected to it. We have no connection to any other David Tennant Forums or Fansites.